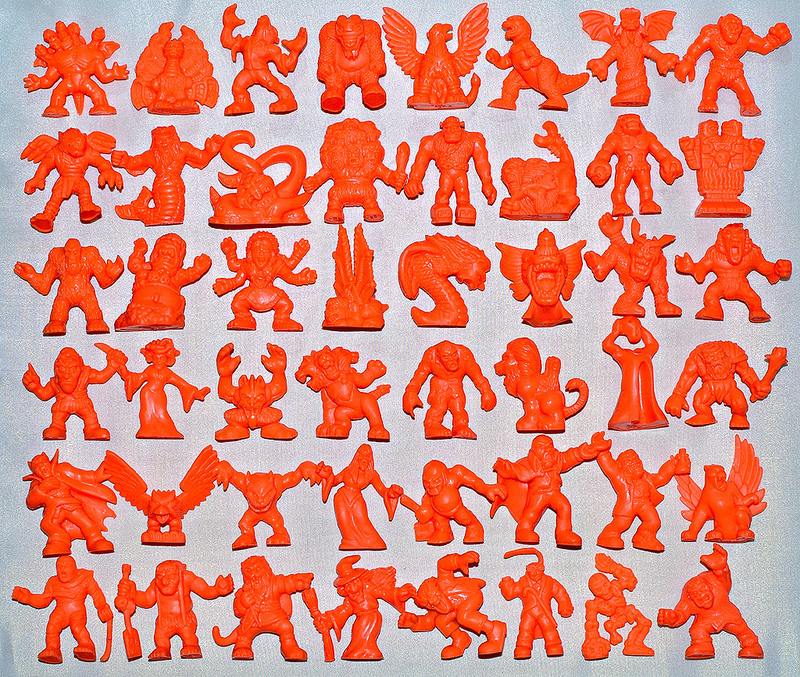 I've always thought the "neon red" color was one of the most attractive colors for monochromatic mini figures. 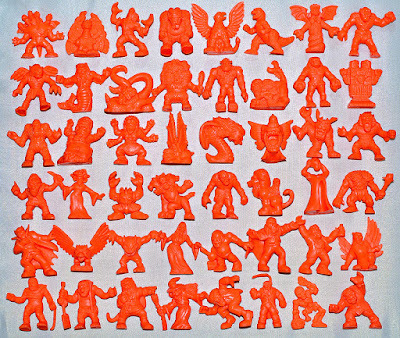 It has appeared in a few toy lines over the years such as Garbage Pail Kids Cheap Toys and Mini Boglins, but the line that probably has the largest number of neon red minis is Monster in My Pocket. 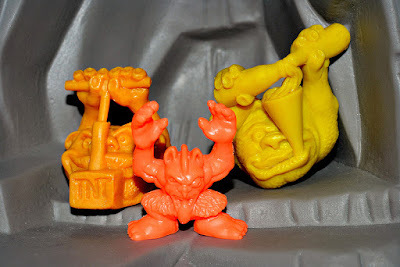 The entire first series of 48 figures can be found in the color, and it was also featured in a couple of the later series such as the Super Scary and Super Creepies sets. When I was kid I always just called this color orange or dark orange, because to me it looked too light to be red. But all the MIMP Series 1 neon variants corresponded to the earlier standard colors (regular purple / neon purple, regular yellow / neon yellow, etc. ), and it's called neon red among collectors. So neon red it was, is and shall be. I recently finished my MIMP neon red Series 1 set, which has been one of my collecting goals for a while. 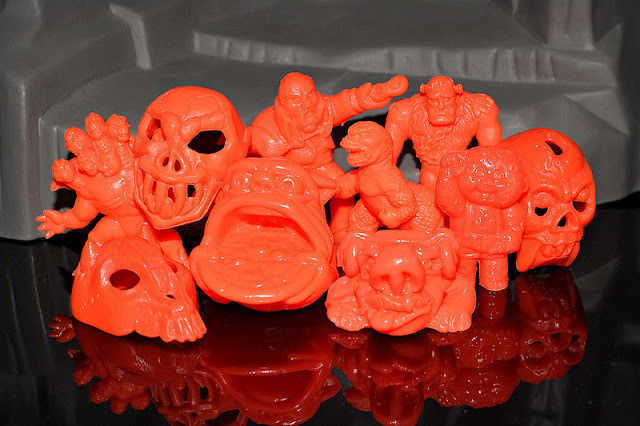 Some of you might know putting together full neon color sets can be very difficult as certain sculpt-color combos are believed to have been sold only in certain countries. Goblin was the last one I needed, which annoyed me until I finally got it, because the little bugger's not even a high point monster! Aside from MIMP, you can see a few examples of neon red weirdos from other toy lines in the first photo of this post. In addition to the lines mentioned above, there's some Ghostbusters Ecto-Plazm ghosts hangin' out. Sure, neon red might not show sculpt detail as well as some other colors, but it's fun, vibrant and impossible to ignore. Personally, I'll take it over the ever-popular flesh color any day. What about you? Do you think it's as rad as I do? 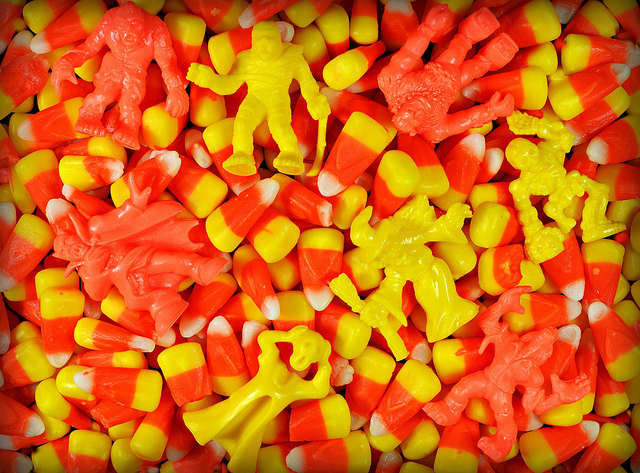 Can you think of any other toy lines that used this color? Good colour. My personal favourite was the green though -- I would love to get one of the Werewolves in that colour!